This new species was named “Granrojo” which is the Spanish word for “big red”. This jellyfish is blood red in color and silently floats through the murky waters of the deep sea devouring its prey as a predator. One very peculiar feature of this jellyfish is that it lacks any tentacles. The jellyfish has a giant red bell-shaped body which has four “arms” rather than tentacles as you would find on the majority of jellyfish. This animal isn’t a rarity either with many sightings reported off of the coast of California, Hawaii, Washington and Oregon. 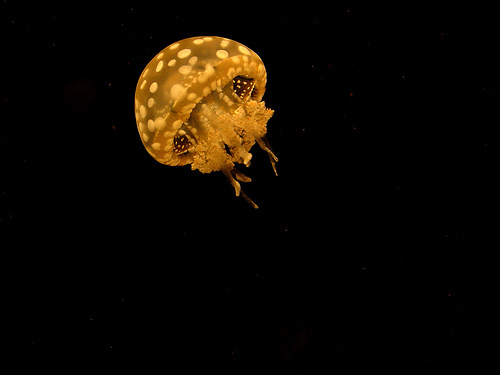 It has been very hard to research this jelly because they shy away from activity with humans and deep sea ROV equipment as they instantly disappear sensing a possible threat.